Vice President Joseph Biden has blamed tuition increases on the high salaries of college professors, seemingly unaware of the fact that there are now over one million faculty who earn poverty-level wages teaching off the tenure track. The Chronicle of Higher Education ran a story entitled "From Graduate School to Welfare: The PhD Now Comes with Food Stamps." Today three-fourths of all faculty are characterized as "contingent instructional staff," a nearly tenfold increase from 1975. Keith Hoeller is an adjunct professor of philosophy at Green River Community College, where he became the first adjunct to win the college's Distinguished Faculty Award. He was also the first adjunct to win the Georgina Smith Award from the American Association of University Professors for improving the status of women and advancing collective bargaining. He is the cofounder of the Washington Part-Time Faculty Association and co-organizer of the New Faculty Majority. He has published more than two dozen opinion articles on adjunct faculty in the Chronicle of Higher Education, Inside Higher Ed, and elsewhere. "Anyone who cares about the future of higher education should read this book." "The picture of our exploitation that emerges is frightening to reflect on. This book is a 'must read'." "There is so much truth in this book that it is scary. I urge you to read it, get angry, gather together and fight. No one can fix this alone. It will take the cooperation of faculty, students, parents, and other workers suffering the same treatment. (Students and parents are horrified when they hear about the treatment of contingent faculty.) The statistics in this book show that contingent faculty have the numbers to give them power. It is time to use it." "Higher education's shameful treatment of adjuncts reflects broader workforce trends that adversely affect millions of Americans in other occupations. Keith Hoeller's invaluable collection explains the price we pay for an employment model that short-changes those who teach and learn in our colleges and universities. If knowledge is power, let's hope that Equality for Contingent Faculty gets in the hands of many other workers who have much to learn from campus organizing against the two-tier system in academia." "There's something weird and creepy about a democracy that insists upon universal 'access' to higher education and then denies a majority of its college instructors a professional wage, or even a living wage, all the while driving each successive group of graduates into a greater amount of average debt. 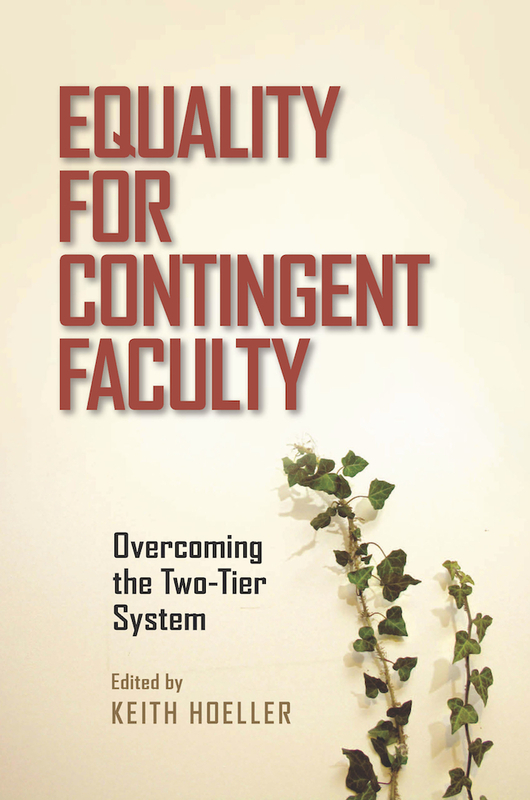 This essay collection sheds light on how the two-tier system of tenure-track and non-TT faculty contributes to these gross inequities." "This book tells the story of the transformation of higher education in the United States and Canada as a place where skilled teachers earning decent salaries and benefits were free to teach students and pursue their research interests in a climate of relative security, to one in which most classes are taught by skilled but poorly paid and extremely insecure contingent faculty. The great irony of this transformation is that those who teach do not enjoy the wages and benefits they are presumably preparing their students to enjoy, in many ways working under circumstances not so much different from those of migrant farm laborers, who often cannot afford the food they produce for the rest of us. Unfortunately, tenured faculty, even in unionized colleges, have used their power to protect themselves, not only ignoring but acting in a hostile manner toward their less fortunate part-time colleagues. And yet, as the noted teachers, scholars, and activists in this timely volume tell us, there is hope. The book provides many examples of successful struggles, waged largely by contingent faculty themselves, that have not only won better wages, benefits, hours, and working conditions for these, most exploited of professors, but have revitalized teacher unions and improved the academic life of their workplaces. Equality for Contingent Faculty not only reveals the dirty little secret of today's higher learning, but it also offers a workable roadmap for change." "This book is a major contribution to the effort to expose and combat one of higher education's dirtiest little secrets: the fact that most post-secondary classes are now taught by contingent faculty without living wages, job security or academic freedom, or even health or retirement benefits. But this collection is not merely a bemoaning of a terrible reality and its awful consequences for teachers and students. It also is full of ideas for how to build a movement, inside and outside the academy, to change this. No informed reader will agree with everything presented, but everyone will learn new and important ideas. There is no substitute for contingent academic workers speaking for themselves, and in Equality for Contingent Faculty, they do so, and eloquently." "Most Americans do not realize that when they send their children to college many of their classes will be taught by contingent, 'adjunct,' faculty. These professors are poorly paid, receive no benefits and are often mistreated by administrators. Nevertheless, adjunct faculty are typically well qualified in their subjects and love to teach. The essays presented in this excellent volume explore the world of the adjunct faculty and show that contingent need not and should not mean unequal."